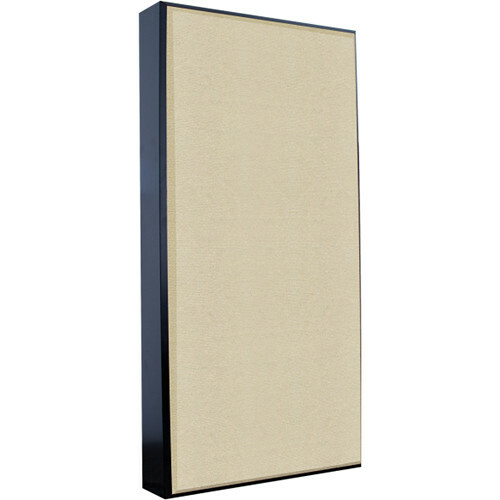 The sandtone Deep6 Low-Frequency Absorber from Auralex is a sound absorption device. It is designed to be installed on a wall or across a vertical corner to improve low-frequency absorption throughout the room and accuracy at the mix position, without the sonic artifacts of competing products. This acoustical treatment provides usable broadband control down to 80 Hz and is a suitable choice for rooms where the installation of corner-fitted bass traps is not possible due to doors or windows. When corner mounted, the Deep6 provides effective low-frequency absorption down to 40Hz. Two mounting brackets are included for mounting the Deep6 on a wall; corner mounting hardware is optionally available.